Terravita offers world class amenities in an elegant desert setting, from invigorating athletic diversion to fine and casual dining. All Terravita residents experience the benefits of a 24 hour guard gated community, including 24 hour community patrol service, social membership in the Country Club, which includes use of the Fitness Center, Pool, Tennis and Desert Pavilion - Community Center. The private 18-hole championship golf course designed by renowned golf architects Billy Casper and Greg Nash, offers a complete golf pro shop, teaching professionals, and an extensive practice facility. 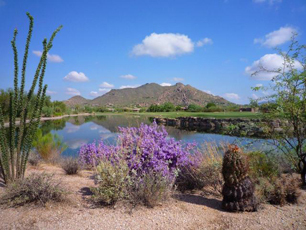 The course reflects and respects the magnificent high Sonoran desert surroundings, creating a true celebration of both the game and its environment. Being awarded an impressive first place in Ranking Arizona 2005, 2006 2007, 2009 The Best of Arizona Business listing of the area's top 10 private golf courses, Terravita is highly acclaimed for its unique attributes. Terravita is as much a lifestyle as it is a community with resort-style living which includes a first class amenity package. All Terravita residents can enjoy the Country Club amenities, health and fitness amenities, and activities at the Desert Pavilion community center. The Country Club amenities include a beautiful 32,000 square foot Clubhouse; casual and fine dining with patio seating and dramatic sunset views, theme parties, monthly social activities, happy hours, block parties, and daily concierge service. Terravita also offers outstanding health and fitness amenities including a state of the art fitness center with personal trainers and massage therapists, steam rooms, floor and water aerobic classes, yoga and Pilate's classes; six tennis courts including four lighted courts and one stadium-style court. The newly renovated Olympic-size pool with its beach front entrance easily accommodates both exercising and fun. We also feature an outdoor ramada and spa to help you relax after a spirited tennis match or a challenging golf game. The pool areas are open from 5:30am until 10pm daily. 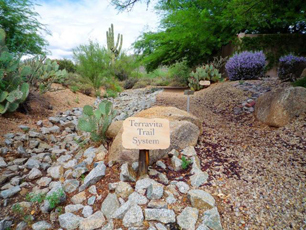 For those residents who enjoy walking for exercise or exploring the surrounding flora and fauna, Terravita has over seven miles of desert walking trails.